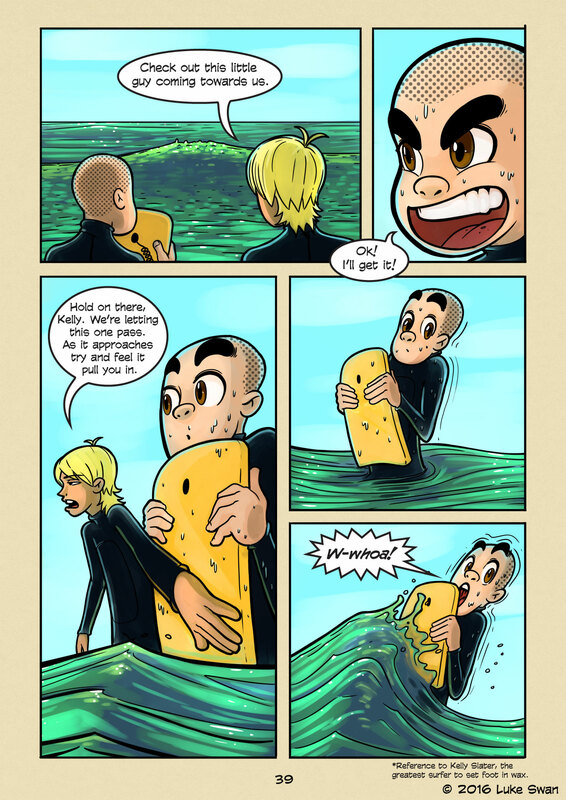 Wave Basics pt.2 (#039) | Web comic "Surfer Joe"
We all know waves push to towards shore while breaking. But the thing some might not know is how the wave pulls you in towards it before breaking. It’s called undertow, and on bigger days it can be really strong. If one is not careful they can get caught in a cycle of getting pulled in and pounded by the breaking wave, only for the cycle to repeat with the next one. Drownings are rare however, as usually super strong undertow happens in the shore break and it is easy enough to get out. These wave basics might seem pretty obvious for some I suppose. I debated with myself long and hard where Joe should start his journey. Should I make him a complete novice? Or make him at least a little competent. I still debate this sometimes. I chose to make him a complete newbie. This way I can document everything I’ve learned(and still learning) about surfing and the ocean. When translating the page to Japanese, my wife asked me what I meant by the wave “pulling you in”. I had to explain to her that that’s what waves do. Her surprise assured me that starting from square one is the right thing to do. Surfer Joe is primarily meant for surfers. But I’m hoping to make it accessible enough to eventually reach a broader audience. Time will tell. What do you think? Too basic? Let me know in the comments!